The difference between a regular crime and a biased crime. Let's compare what happened to Matthew Wayne Shepard to what happened to someone I knew in high school. This guy was obnoxious. I learned years later he had been murdered, similarly to Matt. However, his murder did NOT scare an entire community. In fact, I would not be surprise if he had caused those two guys to beat him and throw him down a cliff. I'd still vote for the death penalty. 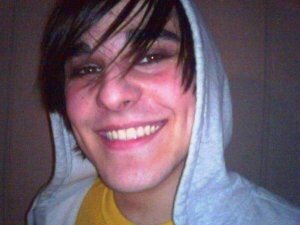 However, Matt's murder was much different. The biased crime, which the muderer pushed as gay-involved, scared the entire community and demands a greater penalty. Below, I offer further explanation. Virginia Foxx, of Winston-Salem NC, really helped the Republicans retreat by calling the Matthew Shepard murder a hoax. Does she think he faked his death? Was it a robbery? Had it been a robbery, then all Aaron McKinney and Russell Henderson should have done was stop the truck, pushed Matt out, and taken off. They could have even burglarized Matt's apartment and escaped punishment. No, they had to tie his wrists to a fencepost. McKinney had to continue beating Matt into permanent unconsciousness. Why? Because they thought they could get away with it by citing that Matt was gay. Somehow all that excuses their behavior. Then McKinney cooked up "gay panic", which exposed his bisexuality, as his excuse. He forgot to tell Henderson the lie that Matt had come onto him while they were in the truck. Hello, those two had just acted as a gay couple to get Matt into the truck! Matt was 1.58 m and 48 kg, and he scared McKinney? Get real! Then McKinney admitted in another interview that it was a biased crime as we approached the eleventh anniversary. Greg Pierotti reported it for the piece of "Laramie Ten Years After". McKinney just can't get his lies straight any more than Kristen Price. Had it been a robbery, it still makes no difference. The crime panicked the gay community around Laramie. It inflicted a greater crime than just a murder. Therefore, such a crime deserves greater punishment. Yes, Virginia, there is a real crime which targets sexual orientation. No more "gay panic", or to quote Flip Wilson's Geraldine, "The Devil made me do it!" Had Laramie not received such bad publicity, would the district attroney gone after McKinney for felony murder? The publicity forced Laramie to spend money to prosecute to the extent that it had to lay off some police. Does anyone think that Laramie would have done so without the publicity? Below is a fine example: the murder (not manslaughter) of Sean William Kennedy in South Carolina (Holy J Strom Thurmond!). The killer must have known he was drunk, so he should have known a punch might kill him. The killer is now out of jail after two years. Someone should punch him in the face with brass knuckles. Maybe he'll fall backwards onto a pavement and break his neck! We'll call it justice. Here's a fine example of the wingnuts and their attempt to bamboozle more rednecks in Philadelphia (I suggest Elk County in central Pennsylvania where the lines of the Republican "T" meet.). Here's where the Nazi lie begins, when people as stupid as Sarah Palin parrot everything they're told. My first reaction was the source. The filthy rich, espeically Big Pharma, are desperate to continue picking pockets for their overpriced care. I'd also suspect that the Fox Network was part of this nonsense. They know the crackers don't have a clue what socialism is, let alone fascism. They know the fools line the pockets of Rush Limbaugh, while the rich do the same for their propaganda. Does any thinking being really accept the corporate state of Fox is "fair and balanced"? The real cause of the crisis was the lack of regulation, as championed by the Schrub himself. Starting a war for Haliburton helped. Shifting the tax burden off the rich onto the rest of us merely extended Reaganomics. Then giving the rich corporate welfare -- as fascism defined -- by borrowing and spending helped as well. Fascism means that government favors the rich over the inferior masses, thus enforcing inequality. Schrub sowed the seeds of the current action, like Reagan, Bush, Harding, Coolidge, and Hoover. The economic royalists are desperately propagandizing the white trash. 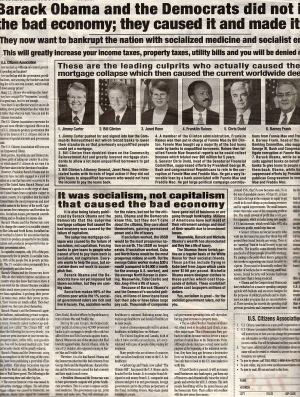 Ironically, we must save capitalism from the capitalists again. As Noam Chomsky would say, "Don't take my word for it, check it out." What happened to the death panel? What happened to any reform of our archaic system? Why didn't they blame FDR and LBJ while they're at it? Sommersturm was an überraschung (surprise) for me this summer. Made in 2004, it won high honors for a brutally honest view of homosexuality in the land which Hitler once ruled. Like "Brokeback Mountain", the subject of becoming aware of one's orientation falls on the protagonist. Even moreso, he begins to fall for his best friend, who is heterosexual. After much denial and swirls of emotion, Tobi finally admits his real orientation. The girl he'd been pursuing understands fully, and urges him to be true to himself. The rest of the rowing team accepts Tobi as he accepts himself. For contrast in the story, there is a stereotypical gay and muscular guy. However, it is the calm and cool gay guy who proves to Tobi how sincere and real one can be. Tobi even asks him for advice on how to cope with the reality of knowing he is gay. Overall, I admit I bought it to hear the German, which is unfortunately spoken too fast most of the time for my ears. Rather than reading the English subtitles, then trying to backtranslate them into German, I'd rather switch the subtitiles into German and follow the story totally immersed in German. I highly recommend this sensitive approach of a movie to any late adolescent (rated R) who's struggling with his sexuality. 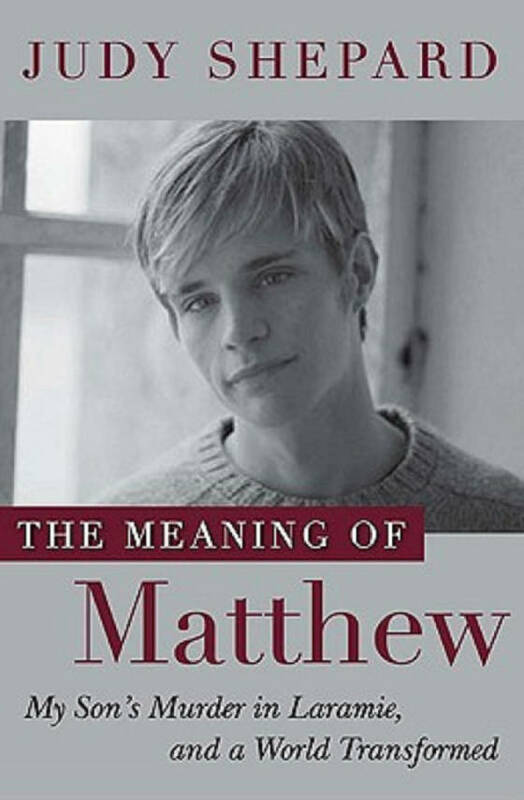 Judy Shepard's "The Meaning of Matthew" answered some of my questions from Romaine Patterson's book. I first learned of the affair a decade ago, around the time of Aaron McKinney's trial. I participate in the forum and learned much inside information. Bringing Matt into light as human works well. We find out that (surprise) Matt was sensitive about his size. I was his size right before I turned 11, so I can understand. It reminded me of Leslie Scrivener's definitive book on Terry Fox, which also made his humanity real. I even had to change my perspective of Matt on my website to match the real person historically. 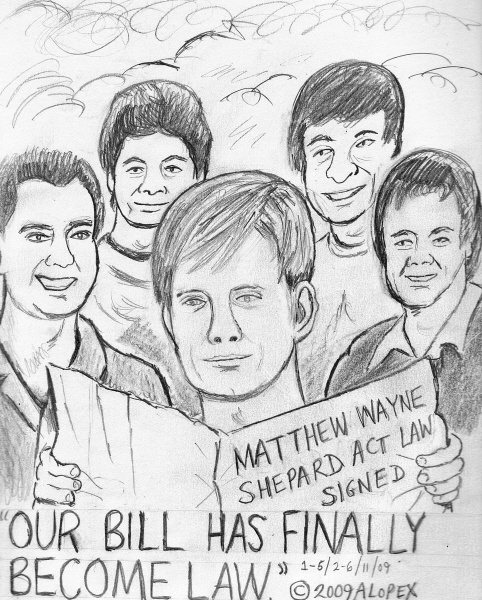 The world has changed much in eleven years, and, like Emmett Till, Matthew Wayne Shepard did not live to see it, but his death was a turning point. As the biased crime legislation becomes law, I also think of Billy Jack Gaither, Ryan Skipper, Scotty Joe Weaver, and Sean William Kennedy as more examples of why we need legistation to protect other communities. God bless those who take tragedy and do good for others! Robert Kiyosaki's "Conspiracy of the Rich" doesn't really expand upon the basic premises. The theme remains that to be diversified means multiple streams of income (to borrow from Robert Allen). Since 1980, taxes have shifted downward and most heavily on employes. Recent welfare for the wealthy has expressed itself in executive bonuses for failures. Unfortunately, the solution is not easy. It means one must take control of one's own finances, which means no simple solution. However, the national debt has decupled since 1981 under borrow (to cut taxes and give welfare for the rich) and spend. Earlier, deficits larger than economic growth caused inflation, which is generally another tax. Now, can the federal government stimulate the mess of eight more years of Reaganomics plus an endless war in Iraq? As we pass the eightieth anniversary of the Stock Market Crash into the Great Depression, we as a nation aren't even that well off.